Railroad company has stymied efforts to date, but leaders continue conversion push. It’s no secret that the conversion of the Big Four Bridge into a pedestrian and cyclist crossing over the Ohio River is a huge success. Just glance at your Instagram feed, and you’ll notice just how many views of Louisville are taken from the bridge. Crowds flock to Waterfront Park to climb its signature spiral approach ramps and cross over to Jeffersonville where a new park and a number of new businesses have set up shop around the bridge. Could history repeat itself downriver with another bridge conversion? There’s an opportunity to create a shared-use path for cyclists and pedestrians along the Kentucky & Indiana (K&I) Bridge linking Louisville’s Portland neighborhood with the flourishing New Albany. A group of dedicated leaders from Kentucky and Indiana has been steadily pushing to open a former automobile lane closed in the ’70s on the bridge to create a 13-mile waterfront loop between the K&I and its Big Four counterpart. Those efforts are picking up steam, according to Marcus Green’s recent report at WDRB. 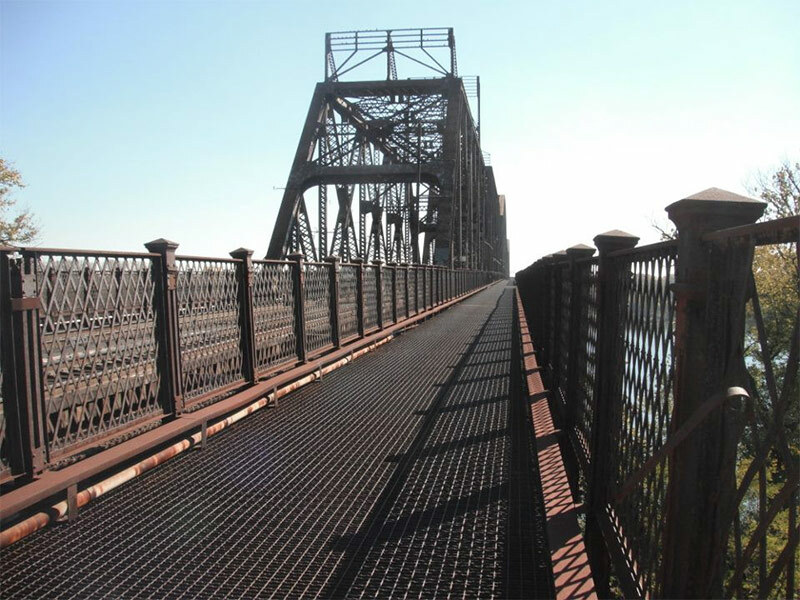 “Greater Louisville Inc. [the city’s chamber of commerce] is making a new push to highlight the bridge’s role in completing an urban trail system that ‘has the potential to become truly regional,'” Green wrote. That organization has listed opening the bridge among its legislative priorities for 2016. The decade-long effort has, until now, been stymied by bridge owner Norfolk Southern Corporation, which says it won’t open the extra lane due to safety concerns. 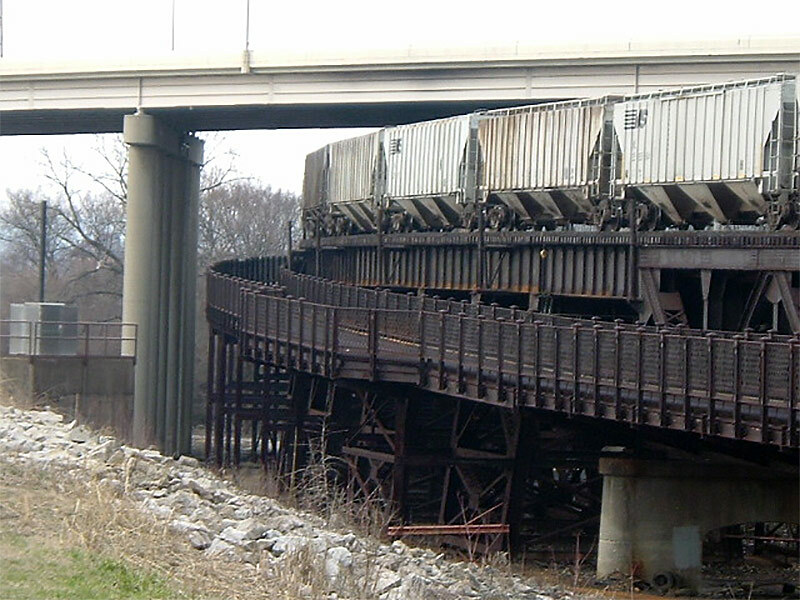 Green reported that “despite the railroad’s concern, laws in Kentucky and Indiana generally protect property owners if someone is injured while using a recreational trail.” He added that Norfolk Southern and other railroad companies operate similar trails next to active rail lines in other states. Citing a report by the Rails-to-Trails Conservancy, Green reported on a remarkably similar conversion project in Memphis, Tenn., where the Harahan Bridge over the Mississippi River will open this year with a pedestrian and cyclist lane next to an active Union Pacific Railroad line. Green went on to note that Norfolk Southern itself operates seven rail lines next to shared-use trails, including one along the Schuylkill River in Philadelphia. In both cases, the shared-use trail is separated from the rail line by a fence. Louisville could do the same thing. And affordably. David Karem, president of the Waterfront Development Corporation, told Green that because the bridge already has approach ramps on both sides of the river, infrastructure costs would be greatly reduced. But Karem added that efforts to date have been met with “complete resistance” despite a powerful list of supporters. Over the years, Green wrote that top officials including current Louisville Mayor Greg Fischer, former Mayor Jerry Abramson, former U.S. Representatives Anne Northup of Kentucky and Mike Sodrel of Indiana, former Jeffersonville Mayor Rob Waiz, former New Albany Mayor James Garner, and former New Albany Councilman Steve Price have issued support for the project through letters, meetings, resolutions, and more. Even with threats of using eminent domain to acquire an easement along the bridge, Norfolk Southern has yet to budge on its position. But Louisville is pressing on. 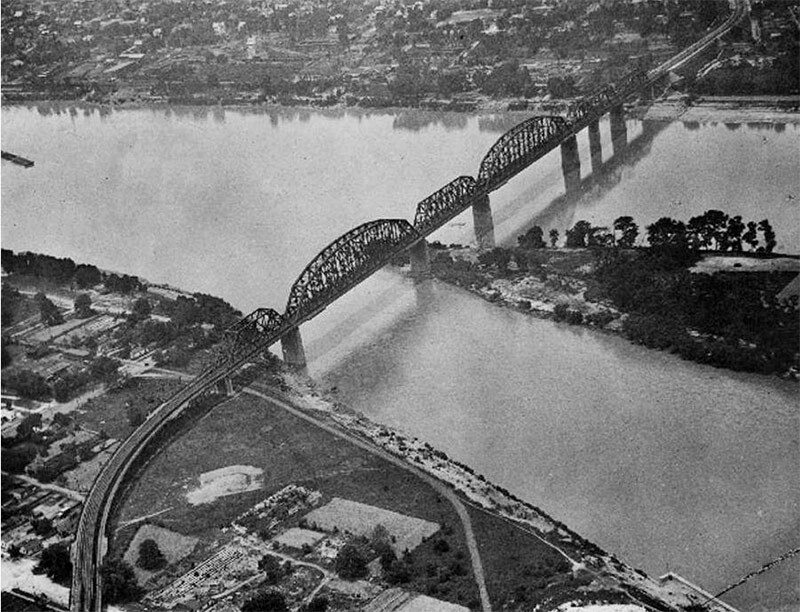 Read Green’s full report on efforts to convert the K&I Bridge over at WDRB. Opening this bridge to pedestrian and bicycle traffic is a good idea, but it makes me wonder why the new Abraham Lincoln bridge wasn’t designed with a separate pedestrian/bicyclist easement as well? Thinking of, say, the Williamsburg Bridge in NYC which, when renovated, a separate easement was added. The more ways there are for pedestrians and bicyclists to cross the river, the better — I’ve seen people walk across the bottom deck of the Sherman Minton Bridge, which is crazy dangerous. Then not ask the obvious follow-up question, which is how much of that $14 million actually finds its way into the Waterfront Development Corp. budget? If memory serves, the original plan for the Lincoln Bridge included such a pedestrian/bicycle element. This was swapped to the Big Four Bridge for an oligarch to be named later. I worked for NS for years, and on that bridge, it would need a lot of work for the roadways to be used, and with NS being the owner of it, why would they need to spend the money to do it. It would be no different than someone coming to your house and telling you that you need to spend a ton of money to repair something that you don’t use. In the spirt of publicly sharing information regarding the K & I Bridge I have compiled all the Louisville, New Albany, Indiana, Kentucky, and U.S. laws pertaining to the K&I Bridge Company. To that I added government reports from the Kentucky Railroad Commission and the U.S. Coast Guard. I have compiled them all in word format and can email any person a PDF file. Those findings do indicate the public have a right of access on the K & I bridge. Bridge company does have the right to charge a toll though. Other key point is there is no known accident involving a walker or biker in nearly 90 years of use of the common roadway. After the railroad closed the bridge in 1979, four people climbed on the structure, fell off, and died. If you would like to read the information send and email to sgreseth@alumni.iu.edu and place K & I bridge in the subject line. Rumors (certainly innocent rumors) spread by waterfront development staff that that the bridge company went “bankrupt”. The bankruptcy judge waived all those old laws. So then, we contact the National archives and spoke with their exceptional staff. They said that U.S. did not have bankruptcy laws at the time the bridge company was insolvent. And a civil judge could not change those laws. If you want to review those documents pertaining to the K & I, see the email below from Arlene Royer at the National Archives in Atlanta. You need to know the case file number. The Indiana case files are stored in Chicago and I don’t know that case file number yet. The National Archives for Kentucky court cases is located at 5780 Jonesboro Road, Morrow GA. This is in reference to our conversation concerning the Kentucky & Indiana Bridge Company. I was able to locate equity case #6289 filed in the Circuit Court of Kentucky at Louisville. The case is extremely large, probably close to 4000 pages and it is not in any particular order. After searching for several hours, There are many stakeholders involved and almost each stakeholder had an appointed receiver, all seeking resolve for some type of compensation, We can copy the case, but I doubt you need it all, and I can’t really read every page seeking something you might want. I then decided to see if we had dockets for the case, which we did not have but instead found the “Complete Final Record” volumes which include your case. These are synopsis of each case, your case spans the last 300 pages in one volume and continues into another. This is a hand written account in extremely large bound books, which can not be placed on the photo copy machine. Again, it is not something I can not read through, since it is too lengthy. Copies from the docket will probably be very expensive as it will require the use of special cameras, and we still may loose text in the fold of the pages. These records are open to the public, you might want to come and review what we have. You can bring a camera and copy free. There was a deed for Harris as that portion went on appeals, and that appeal document is in the file. I did find some copies of orders and documents filed in the I Indiana case as well. That is case #8918 U.S. Circuit Court for the District of Indiana, Chancery case (basically same as equity) . Call me if you want to discuss what I found. I am sorry I can’ t just pick out the items you are seeking but it is just to large and complex. If I’m not mistaken those lanes were condemned for safety reasons. Why would they want to make the repair. They have been offered plenty of money for the fencing, post and rails and they weren’t interested. Yes look at the history of that bridge. It has NEVER been a public access bridge. From it’s first day it’s been a privately owned toll bridge. So it should be ok for people to bike and walk thru your yard or your business just because people think it’s a neat thing to do? Of course nobody is offering NS a deal to open it back up as a toll bridge. If my memory serves me, the southbound lane for car traffic sank about a foot. The northbound lane is used by NSF for emergencies like the one a couple years ago when a train caught fire on the bridge. I would like to know where the Chamber of Commerce gets their sense of entitlement. How many walking bridges are needed in this area. If you have no problem with eminent domain I suggest that you fix up an area of your home and house the homeless. That would surely do a greater good for society than another place to walk. Why are so many people popping up to shill for Norfolk Southern? I wouldn’t have possibly imagined so many people that visit this site are so interested in keeping this bridge closed even though all the arguments against it have no basis. My understanding is an overweight truck damaged the road decking and the road bridge was closed. To get to the Indiana side of the bridge you have to go through an active railyard. Extremely unsafe. I support the idea,, but only if the railroad company decides to go along. It would be an awesome addition to the downtown trails. I am very much opposed to forcing a business to give up their rights when doing so will not cause the community ANY harm. There is no lack of access for pedestrians and cyclists to cross the river with the Big Four and 2nd Street bridges. This would be an amazing extension, but the business that paid to build the bridge and has been maintaining it and continues to use it as part of their infrastructure should not be threatened by municipalities and other groups because it would be nice. Eminent Domain has no place in this conversation. A case could be made for the public taking over parts of many businesses assets because it would benefit the community. There is no detriment here to build a reputable case on. Beg the railroad to go along, give them incentive to do so, but do not legally force it just because it would be a great addition. The Big Four and Second street are nice if you live in or around downtown Louisville, Jeffersonville, or Clarksville and want to go to one of those, but there are no pedestrian access points for people in western Louisville or New Albany. If you are wanting to go from west Louisville to New Albany and not take a car or bus, you have to go many miles out of the way. I’m all for private property rights, but this is a public right of way issue and, one might argue, interstate commerce given the economic impact that the Big Four has had. I think eminent domain is entirely appropriate in this case. As for the New Albany connection, there is no rail yard as David Morse said, but there is a two track spur that crosses the roadway on the western side. It looks like the existing roadbed is just around 10ft, wide with periodic 15ft. pull-offs, so they would almost certainly need to open both sides for crossing unless they could widen the east side to 15ft. (which would still be 5ft. narrower than the Big Four). Assuming they opened both sides, they could cut a short tunnel under the west side spur to safely reconnect with the old ramp. That way both sides could connect with Vincennes St. (which I think New Albany would want). Otherwise, the trail would have to wind down to Water St. and connect to the Ohio River Greenway. This would bypass any commercial district and severely limit the economic impact of the project. The simple fact is that the bridge will NEVER open to the public because our society is too litigious. This is a privately owned bridge and allowing the public to use is opens the company to the potential of law suits. We have no own but ourselves to blame. I don’t believe that anyone expects NS to have to pay for the conversion. It’s silly to assume otherwise. What we need is their willingness to let “us” use it. Granting them a liability shield(if not one already in place)would also be needed. On March 22, 1976, my uncle James Harper was kidnapped from VV Cooke Chevrolet by 3 very evil people. They drove onto the K&I and tried forcing him to jump from the bridge. When he refused, they shot him twice causing him to fall in to the river. He was recovered a month later, approximately 10 miles downstream near the end of Lees Lane. I’m happy to see this bridge preserved. This bridge is where James spent the last moments before his life was taken by these 2 horrible men and a horrible woman with them. Seems appropriate that the bridge should stand where he made his last stand. Private property what don’t you people understand.Go walk and ride your bicycle some place else. Louisville should be more concerned with being a “Sanctuary City” and the negative impact it is having on Jefferson county social services . Simple solution is to Demo the walkway because of the liability .Problem solved.